NEW YORK — Sotheby’s conducted its auction of Impressionist and Modern art to a triumphant conclusion, with 57 lots bringing nearly $200 million on Wednesday night. Only 13 lots remained unwanted out of the 70 that were offered. The session included better pictures than at Christie’s, and not least, the estimates had been set more conservatively. The overall success, if measured in dollars, hinged in great part upon the two star lots, both of which performed surprisingly well. Sotheby’s boldly illustrated for reference purposes two other monumental views of the village Litzlberg am Attersee that are actually vastly superior. But the picture seen at Sotheby’s has a dramatic history that put it in a different perspective. It was originally acquired from Klimt by a couple of Austro-Hungarian collectors who were great art patrons, Viktor Zuckerkandl and his wife, Paula. After their deaths in 1927, the landscape passed into the collection of Viktor’s sister, Amalie Redlich. When Hitler, who had incorporated Austria into the German Reich in 1938, decreed the “Final Solution” three years later, Amalie and her daughter Mathilde, who were Jewish, were deported into what is now the Polish town of Lodz. There, they vanished, dying — perhaps murdered — in circumstances unknown. By 1944, the Klimt was hanging on the walls of the Residenz Galerie in Salzburg, also known as the Museum der Moderne Rupertinum. This year, the landscape was handed over in the spring to Amalie Redlich’s heir. It was announced that a portion of the proceeds of the sale would be donated to the Salzburg museum for the construction of an extension to be named in Amalie Redlich’s memory. No one can tell to what extent the tragedy surrounding the history of the picture inspired some of those who took part in the very long bidding match for the Klimt. 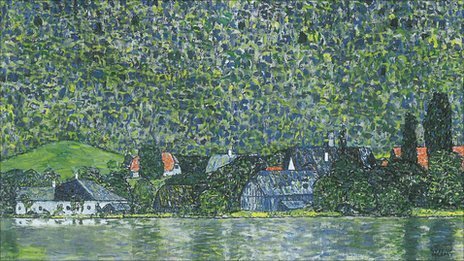 The extreme rarity of large landscapes by the Austrian artist in the market was undoubtedly a major factor in the huge price that “Litzlberg am See” commanded on Wednesday. Monumental size and a magic name were likewise crucial to the success of Picasso’s “L’Aubade.” This one-day picture, dispatched by the artist on June 6, 1967, realized an astonishing $23.04 million, even though it is done in Picasso’s most provocative, cartoon-style manner, with an exceptionally grim touch. A skeletal man whose fleshless ribs are apparent sprawls alongside a goggle-eyed, bare-breasted woman and plays the flute to her. His emaciated legs are raised in a posture that is uncomfortably reminiscent of the most terrifying photographs of dead or dying humans in the German concentration camps liberated by the Allied forces at the end of World War II. Had the estimate for “L’Aubade,” set at $18 million to $25 million, plus a sale charge in excess of 12 percent, not been carefully calculated, the Picasso could have come to grief, as did the two main Picassos offered at Christie’s the day before. To be fair, another factor worked in favor of Sotheby’s picture. It was acquired by its consignor, an unnamed “North American private collector,” as long ago as April 2, 1979, at Sotheby’s London. The experts tactfully refrained from mentioning the price then paid by the North American consignor — £53,900, around $112,600. On Wednesday evening, money flowed into art regardless of school or style, as was spectacularly demonstrated by two contrasting world auction records. “Le Pont d’Argenteuil et la Seine,” by Gustave Caillebotte, set a record for the Impressionist master at $18 million. When last offered at auction in November 2008 at Christie’s, the view of the Seine running under the bridge at Argenteuil had fetched $8.48 million. At the time, this was a very large price. Caillebotte, one of the boldest followers of the Impressionist movement, is at long last coming into his own. The other world record set at Sotheby’s greeted an artist who could not be further removed from Caillebotte. Tamara de Lempicka indulged in kitsch portraits with an expressionist twist. Some veer to hyper-realism, as is the case with “Le Rêve (Rafaëla sur fond vert),” sold for $8.48 million. At the other end of the artistic spectrum, German Expressionism was received with the same enthusiasm. “The White Sound,” painted by Wassily Kandinsky in 1908, brought $8.93 million, despite its very confused composition. Impressionism, which had been losing ground, was looked at afresh with great interest. A magnificent view of “Antibes, le fort,” painted by Monet in 1888 at the height of his Neo-Impressionist phase, exceeded its high estimate at $9.26 million It was one of the great masterpieces in the 1997-1998 show “Monet and the Mediterranean,” which traveled from the Kimbell Art Museum in Fort Worth, Texas, to the Brooklyn Museum of Art. Just how its sale can “benefit” the collection of the Boston Museum of Fine Art, which consigned it to Sotheby’s with other pictures, boggles the mind. What on earth were they thinking about?